Online product reviews can be an influential form of marketing, with the potential to help merchants make more sales. Properly encouraging reviews includes making reviews obvious on a site, giving reviewers expert status and prestige, and making it very easy to review products. There is also a darker side to review marketing, which online retailers can avoid by encouraging shoppers to create reviews — not pushing for or buying those reviews. Making reviews an important part of every product category page and every product detail page on a retail site lets shoppers read honest peer opinions about the products available for sale and are the first step toward encouraging additional reviews. Shoppers who are persuaded to buy an item because of reading a review may be more likely to review that item themselves. A great example of showing off reviews can be found at Newegg. This California-based online retailer places product review information directly across from the product image on its product pages. Newegg places product reviews inline with product images on category pages. 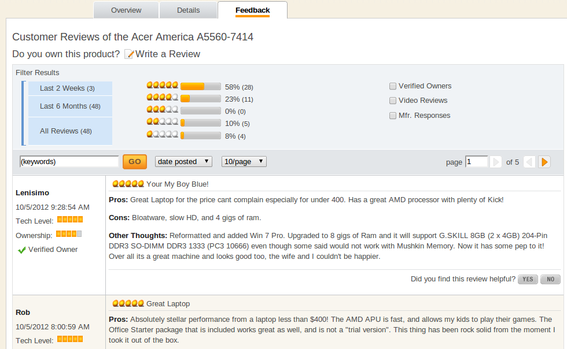 On product detail pages, Newegg has a “Feedback” tab listing all of the customer reviews. Reviews written by folks who have purchased the item from Newegg are shown with a green check mark and the label “Verified Owner.” Given concerns about the validity of some product reviews, this is a great way to let shoppers know that these reviews may be trusted. Newegg devotes an entire tab to reviews on product detail pages. It is not a good practice to offer discounts, rewards, or even chances to win a prize to encourage customers to write product reviews, but it may be acceptable to reward reviewers with prestige. People like knowing that their opinions matter. People also like being recognized by peers. Appeal to both of these “likes” by giving reviewers expert status and notoriety on site, in social media, and in email campaigns. To do this, post a review of the day on Facebook, Google+, Twitter, and Pinterest. Email the reviewer to let them know that they were the reviewer of the day. Also, consider including popular reviews in regular email marketing campaigns. It is still all right to ask customers to review products. Although concerns have been raised about buying or faking reviews, it is acceptable to simply ask for a review, so long as nothing is promised in return other than perhaps improving the shopping experience. Ask for the review via email about a week or two after a customer purchases. Also, ask for reviews directly on the product detail page. Product review marketing came under scrutiny — see “Fake Reviews, a Despicable Practice?,” my previous article — in January and February 2012 when a seller on the Amazon Marketplace was believed to be “buying” positive reviews. The offensive act, according to many commentators, was that the merchant was refunding the item’s purchase price, seemingly in exchange for positive reviews. Customers were not necessarily aware how the company’s more than 400 positive reviews had been generated, and the trust that necessarily makes review marketing effective had been undermined. In short, it may be all right to ask for reviews, but it is not acceptable to buy them. What's an Inappropriate Product Review?